Try it out on Google.com by signing in and searching for [my photos] or [my photos from new york last year] or [matt’s photos of food]. You can also try out this feature on Google+ Photos. Update (4:45 p.m. PST): To clarify, searching for [my photos] and similar terms is currently available in English on Google.com when you are signed in to your Google+ enabled Google Account. Your photos represent some of your most important memories and life events, yet they are increasingly difficult to manage as you build up your photo library, accumulate new devices and make new friends. 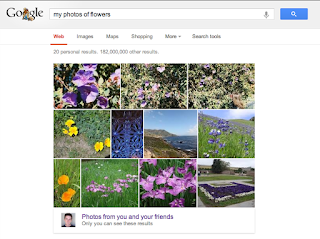 In many cases, searching for your photos can be challenging because the information you’re looking for is visual. Starting today, you’ll be able to find your photos more easily and connect with the friends, places and events in your Google+ photos. For example, now you can search for your friend’s wedding photos or pictures from a concert you attended recently. To make computers do the hard work for you, we’ve also begun using computer vision and machine learning to help recognize more general concepts in your photos such as sunsets, food and flowers.